When this card is Normal or Special Summoned: You can target 1 of your banished LIGHT or DARK monsters and 1 card your opponent controls; return that banished card to the Graveyard, and if you do, banish that card your opponent controls. 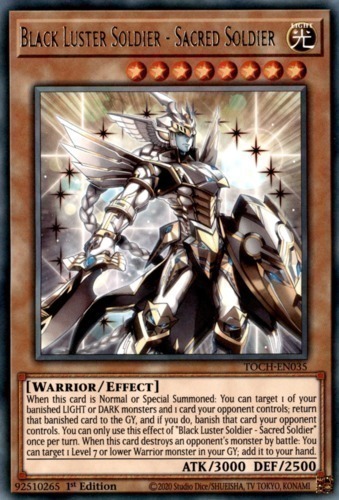 You can only use this effect of "Black Luster Soldier - Sacred Soldier" once per turn. When this card destroys an opponent's monster by battle: You can target 1 Level 7 or lower Warrior-Type monster in your Graveyard; add it to your hand.